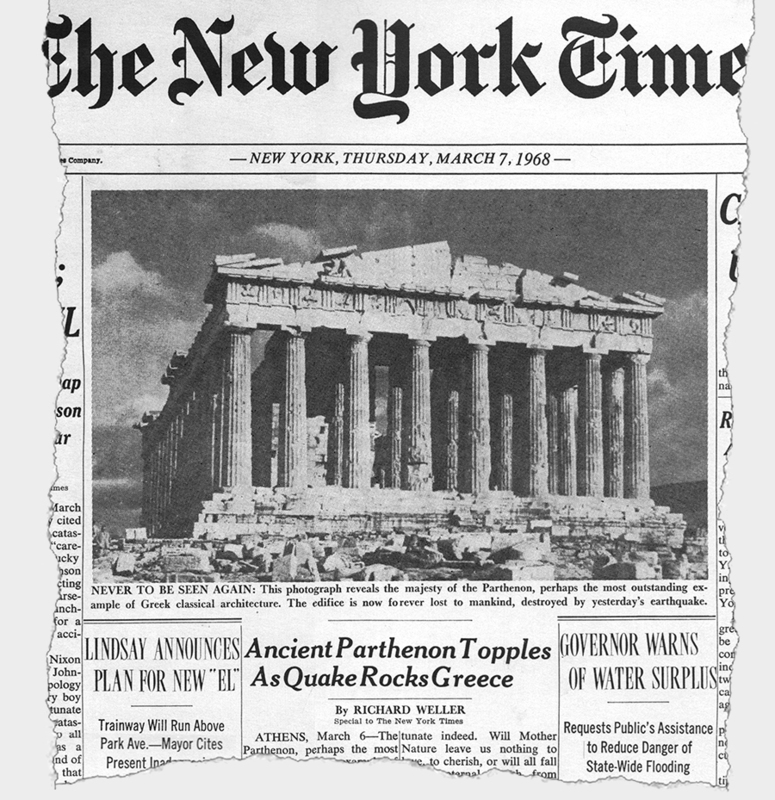 Reports of (weeping over) the Parthenon’s death were greatly exaggerated. Parody By: Harvard Lampoon. Date: March 7, 1968. Length: Front page only? Contributors: Rob Hoffman, Jonathan Cerf, Peter Gable. 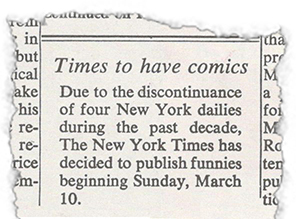 Availability: Very rare; reprinted in the Harvard Lampoon Centennial Celebration (pp. 38-39) and 100 Years of Harvard Lampoon Parodies (pp. 30-31). “Then Mr. [Rob] Hoffman, a sophomore, and his two key assistants, Jonathan Cerf, son of Bennett Cerf, the book publisher, and Peter Gabel, son of Martin Gabel and Arlene Francis, went more deeply underground. A few weeks ago, as deadline time neared, several of the Lampoon’s trusted spies were assigned to trailing distributors of the genuine Times, noting which newsstands were major drops. “Wednesday night, other valiants from The Lampoon went to Times Square area and gathered up some 500 copies of the Thursday morning paper shortly after they hit the street. With these papers they flew back to Cambridge. In this the men of Lampoon were being particularly devious. They reasoned that many Harvard students who got the fake edition of The Times might turn first to the sports page and realize the hoax. Those 500 copies are this morning’s Times except for Page One. “But no such precautions were taken for Cambridge residents who get their papers from newsstands. Those copies had the false Page One wrapped around the edition of last year’s March 2 edition. 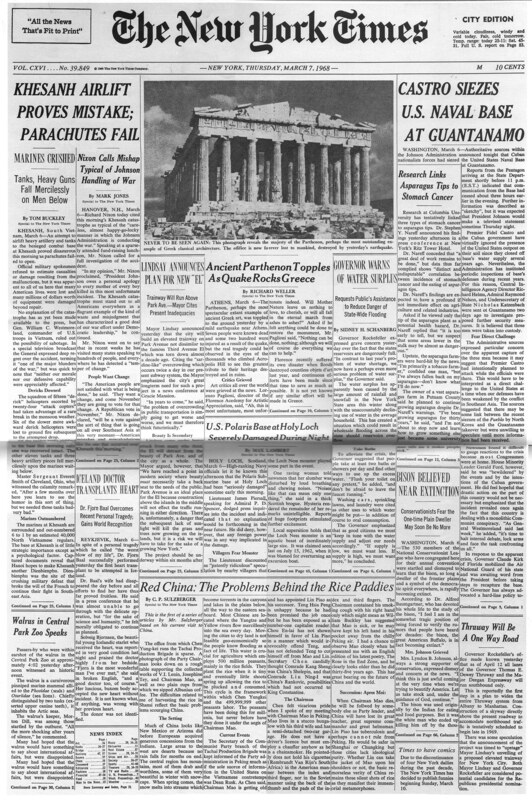 This entry was posted in College Parodies, College: 1946 on and tagged 1960s, College, Harvard Lampoon, Newspaper, The New York Times. Bookmark the permalink.